After 6+ months of not being more than 2 hours away from my home, the time finally came for me to hop on a plane and go far away. I will admit to being a little stressed about this trip. Yes, I am stressed about everything these days, and one little thing can set me down a crazy path, but in this case it was somewhat justified. I am going straight from a work trip to a fun trip, and trying to cram it all (10 days) into a carry on suitcase. Gulp. I arrived here in the lovely city of Boston last Friday. Flew on a red eye...I am not quite sure why I always think those are a good idea. I try to remind myself I am not 24 anymore and can't function that well on no sleep, but I am a glutton for punishment, I guess. I arrived to a crisp fall day, complete with leaves turning orange and falling around me. Off to a meeting in a nearby town, then back to the City and a quick crash. Oops....night one, gone! So...morning #1 got off to a slow start thanks to this comfy bed. I finally rolled out and took a run down the Charles. I guess this weekend is Head of the Charles, a huge race...while they didn't come all the way down to where I was running, I could see the many crew boats out there ready to race. It also explained the fifty bazillion people all over the place! The run was not one of my best. I am not used to the cold, for sure! After that I walked around Back Bay for quite some time. What a cool place. Apart from the extreme crowds, and their extreme inability to walk any faster than very slow or walk less than 3 people across, this area is awesome. I am not a huge shopper, but spent the day perusing all the different shops I could find on this one street. There weren't a lot of chains, and there were a bunch of stores we don't have in SF. What a nice change of pace! There is also this very cool mall, across the street from my hotel, full of shops we don't have at home. And some we do, which was also good, as I had forgotten a few things (like anything to wear during the day while in Boston or NOLA). After a full day of walking, it was time for a beer and some ball. I can't believe how late national sports start here on the East Coast. Last night's game didn't start until 8pm (which means, at a minimum, it wouldn't be over until 10pm, but in actuality didn't end until midnight). On a weekend this isn't the biggest deal, but imagine on a weeknight. Eek. Today's football didn't even air until 1pm. 1pm!!! Where is the laziness in that?! I'll take my rolling out of bed, doing a quick walk with the poochie, and rolling back onto the couch to watch ball all day. 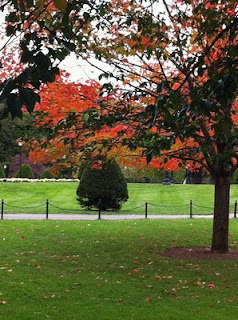 Anyway, today was another lovely fall day in Boston...complete with a little rain. I walked up to Public Garden and Boston Commons. All this walking reminds me of what I love most about traveling -- just wandering and getting lost in where I am. It could not have come at a more perfect time in my life, when getting lost is the only thing that makes some sense. If it weren't for the cold (Luca would hate the little booties he'd need to wear), I think I could get used to this place.